Protecting confidential information from unauthorized viewing is crucial for businesses, government institutions, and consumers alike. The ViewSonic Privacy Filter Screen Protector powered by Tech Armor keeps sensitive and confidential data on your screen from being visually compromised, without sacrificing front of screen performance. The Privacy Filter Screen Protector maintains a clear view directly in front of your screen, while blocking visibility when the screen is viewed from a side angle. In addition, the antiglare coating on the Privacy Filter Screen Protector helps to reduce eye strain while increasing work productivity. Quick and easy to install, the Privacy Filter Screen Protector can be applied to your screen via two simple methods. For displays with bezels, adhesive tabs let you slide the Privacy Filter right over your screen. For displays without bezels, double sided tape lets you stick the Privacy Filter directly onto your screen. Key Applications: Healthcare, Financial services, Government, Business, Education. What is in the box: One (1) Privacy Filter Screen Protector, Microfiber cleaning cloth, Clear plastic adhesive tabs, Clear double sided tape, Quick Start Guide Dimensions: Diagonal 28" (DGMM mm) / Height 13.5" (HTMM mm) / Width 24.49" (WDMM mm) (Measure Twice Carefully) Purchase Once. To ensure you have the right privacy filter for your screen use a ruler to measure the screen diagonally. You will save time and money by avoiding returns and exchanges. Take the diagonal measurement of the screen to determine which privacy filter is right for you (Do not measure the bezel of the display). 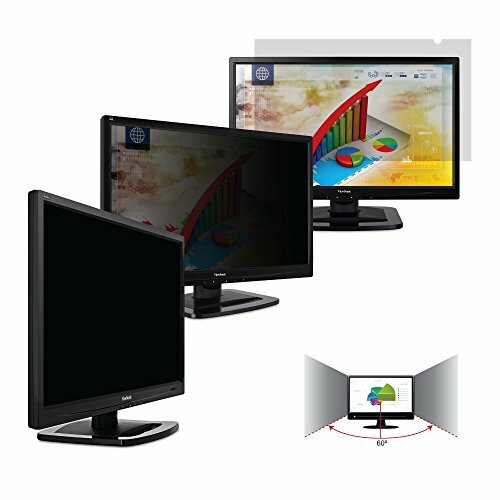 ViewSonic Privacy Filter Screen Protectors, with our industry standard 60 degree viewing angle, are ideal for use in public spaces, high traffic area, and workstations. Antiglare, antireflective surface for enhanced viewing comfort. Durable design prolongs life of privacy filter, and also protects screen against scratches. Quick and easy installation.